Forget the one star rating this hotel is a real gem. Very welcoming and friendly staff, the rooms whilst a little basic are adequate and spotless clean. The breakfast was a toasted baguette and coffee which is adequate and great taken sat outside in the sun, try the toast with oil and tomatoes the Spanish way, it’s lovely. The safe deposit box in the room is only 2 euros a day with a refundable 10 euro deposit. This hotel is excellent value for money and one of the most comfortable and friendly I’ve stayed in, wouldn’t dream of staying anywhere else in this part of Spain, it’s a must. Returning guest and nothing has changed during the last year. Still the same friendly, clean, value for money hotel. It is basic and needs a bit of an update by now but I suppose that would increase the price. Remember, you get what you pay for and you won't get better than this for your money. Brilliant little hotel in fabulous location. Very basic rooms but spotlessly clean with daily maid service providing towels and bed linen changed regularly. Quaint bar/lounge area serviced by friendly staff. Drinks very reasonably priced. Breakfast was repetitive with a toasted baguette and preserves plus tea or coffee but was adequate to start off the day. 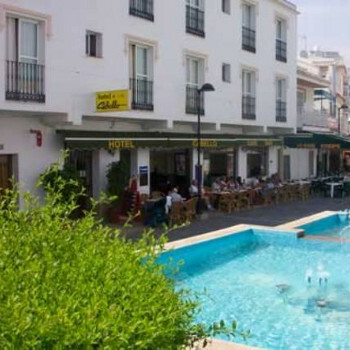 Located just a few steps from the beach with its long promenade linking Benalmadena with Torremolinos. Plenty of bars and restaurants in the immediate area but nothing rowdy. The front of the hotel was a suntrap where you could sit outside enjoying a drink or your breakfast whilst people watching. We would definitely visit this hotel again as a couple but please note there is no swimming pool or entertainment so if you're looking for these- this hotel isn't for you. However, the beach is on the doorstep if you fancy a dip. Excellent value for money hotel!